J.J. & Jeff, released in Japan as Kato-chan and Ken-chan (カトちゃんケンちゃん, Kato-chan and Ken-chan? ), is a side scrolling platform game for the TurboGrafx-16. The Japanese version is loosely based on the then-popular comedy television show Fun TV with Kato-chan and Ken-chan which Vin Di Bona Productions used as its inspiration for the popular television show America's Funniest Home Videos. J.J. & Jeff are bungling detectives who are out to solve a kidnapping case. In the Japanese version, Kato-chan & Ken-chan, it is based mostly on the "Detective Story" segments of the show. On May 28, 2007, it was released on the Wii's Virtual Console in North America, and in Europe on June 15. The basic gameplay of the game is heavily based upon, and influenced by, Wonder Boy. However, at the start, the player chooses either J.J. or Jeff to play. The unchosen character will appear at various moments in the game standing by lampposts and hiding in bushes, but remains unplayable. 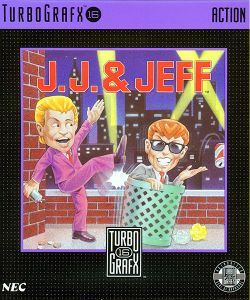 There are three ways to attack enemies in J.J. and Jeff. One is to jump on top of them in an attack echoing Super Mario Bros. The second way is to spray enemies with a can of spray paint. The third is to kick enemies. The game included six levels (fields) split into four parts. A life bar labeled "Vitality" depletes as the character is injured. Eating food hidden in each level will replenish this meter. Money found can be used to play a slot machine game for items. The slot machine is one of several hidden rooms found in each level. Kicking random objects can produce money, food, and other items. Extra lives are obtained at 70,000, 150,000, 300,000 and 500,000 points. The game is best remembered for its off-beat characters and enemies, and toilet humor, including flatulence and urination in the Japanese release. The original Japanese game has a heavy emphasis on toilet humor, most of which was removed for the American version. For example, in the Japanese version, the spray can was originally Kato and Ken's own flatulence. Also, the unplayable character was originally defecating in the bushes and urinating on lampposts, but the urine was removed, and the character was seen wearing a bear mask in the American version. The game is often criticized for being too censored or sanitized when translated for America with most reviewers feeling that the Japanese version was superior in humor and gameplay. This page was last edited on 22 January 2015, at 13:27.